"To make you hear, to make you feel … before all, to make you see" – Joseph Conrad. Impressions of the World in 500 words. This is a deeply personal experience, and I share it with you with great pride and a deep sense of blessedness. For the last week the temperature had been hanging around 19-22 degrees celcius – now it was 6am and already warmer. 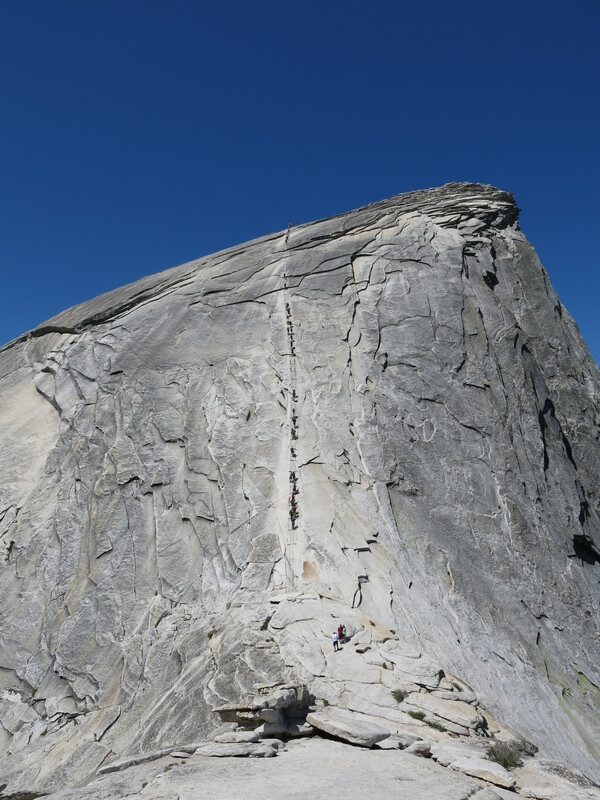 The day was forecast to hit a peak of 36, which made the challenge to climb the iconic Half Dome in Yosemite National Park all the more intriguing. We faced a 10-12 hour hike, a summit of 2,694 metres above sea level and 1,460 metres above our starting position. The cold granite summit was described as “perfectly inaccessible” only three generations ago, just recently (in historical terms) revealing her secrets to those determined to play the role of disprovers. We set off along the mist trail, so called for the heavy showering hikers receive as they pass near the Vernal Falls – an impressively vertical waterfall, in the first hour of the walk – a refreshing occurrence that turned out to be hotly anticipated throughout the return journey. It is not long after the Nevada Falls, whose waters run thinly over slabs of stone giving the riverbed the appearance of glimmering platinum,, that we first caught a teasing glance of Half Dome. A light, grey, smooth mound peered dismissively over the hills to the northwest, soon ducking back down as the path followed the natural curves of the terrain – she looked imposing, to say the least. Packs heavy with liters of water, we stopped briefly to let a deer bound past us on the track no doubt refreshed from the glacial blue/white water running to our right, before pressing on. She rose her head every now and again, Half Dome, to judge our progress and consider whether we were worthy, but for the most part she remained hidden in slumber amidst the rocks. 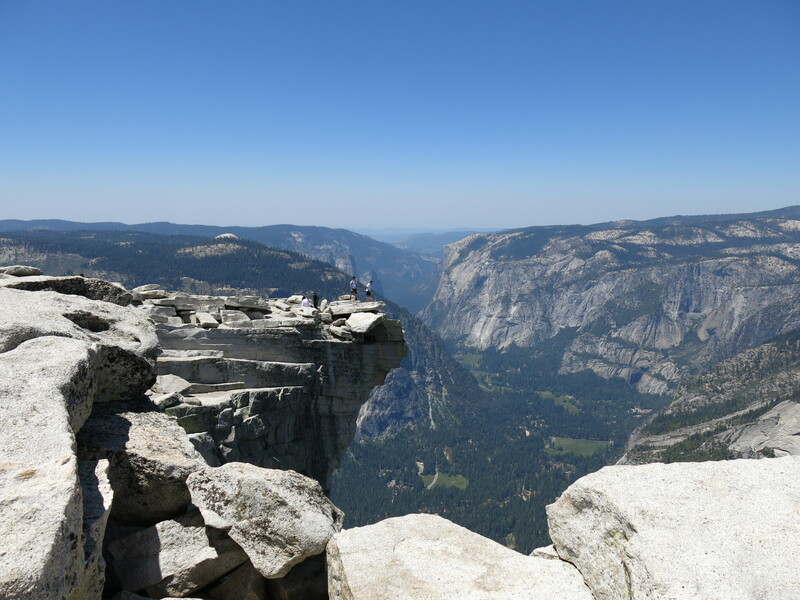 Only the evening before our journey a hiker had perished down the Nevada Falls – not everyone was intended to conquer Half Dome, and those who try must not take her lightly. The trees suddenly parted like a curtain, the sun hitting us with her full might, the valley below opening wide as we stood on the edge of a ridge. In the distance Half Dome was now entirely exposed, her legendary north face which had inspired the brand of the same name sloping vertically down into the valley. Like so many ants we could just make out hikers ahead beginning the ascent of the revered ‘cables’, thick metal cords which assist climbers make the final 120m ascent otherwise considered nigh on impossible, and the most dangerous part of the hike. The terrain flattened out and the path below turned to granite as we made our way towards the beginning of the cables, and pulled out our gloves (despite the now 36 degree midday heat) to assist our grip. We paused at the foot. This was serious. Heather first, we commenced, three steps at a time before pausing, arms straining. The rubber teeth of our hiking boots bit into the granite ineffectively, the sun began to burn. The cables were so hot and the friction so great that the rubber grips on my palms began to melt off. The comeraderie of those behind us helped push us on, and we soon clambered over the top, and were greeted with a view befitting of Gods. The World was endless, the valley thousands of feet below, the river meandering so calmly from up above, nothing above us but pure cyan sky. An eagle soared by at eye level, the Visor of the dome jutted unnervingly out into nothingness. Struck by awe, elated by achievement, we took it all in. It was here, so fitting a place, that I proposed to my now fiancé. We conquered Half Dome together, like so many challenges in life, and came down bound strongly to one another with a promise befitting of the surroundings – as challenging as Half Dome was, we overcame her hand in hand; as infinite as the landscape seemed from her vantage point, our love stretched out forever. I am a 29 year old English literature graduate turned qualified solicitor, which on the whole probably makes me sound entirely unadventurous. I do however believe in the saying "work at living, don't live at work", and there is a lot of world out there to experience. Thanks for visiting the blog, it brings me much pleasure and if nothing else allows me to fondly remember experiences I have had and to share them with you.